Copyright 2019 asp.richtextditor.com. All rights reserved. 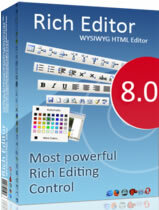 Rich Text Editor for Classic ASP is an award-winning UI control that replaces a standard HTML textarea. It allows for the rich formatting of text content, including common structural treatments like lists, formatting treatments like bold and italic text.